Aplus WMV to PSP converter is a professional PSP converter which helps you convert PSP videos. It is capable of converting WMV to PSP format. It is a powerful PSP converter with fast conversion speed. With it, you can enjoy your favorite internet movie on your PSP anywhere and anyway , It also can convert AVI, DIVX, XVID, MPEG, MPEG1, MPEG2,RM, RMVB, MOV, WMV, WMA, MP3, MP4, VOB, SWF to PSP Video. ...... It is a powerful PSP converter with fast conversion speed. With it, you can enjoy your favorite internet movie on your PSP anywhere and anyway , It also can convert AVI, DIVX, XVID, MPEG, MPEG1, MPEG2,RM, RMVB, MOV, WMV, WMA, MP3, MP4, VOB, SWF to PSP Video. * Support Convert WMV to Sony PSP Video. * Support Convert FLV, Flash Video, Youtube's Video to Sony PSP Video. * Support Convert AVI to Sony PSP Video. .
* Support Convert Divx to Sony PSP Video. * Support Convert XviD to Sony PSP Video. * Support Convert ASF to Sony PSP Video. * Support Convert MOV to Sony PSP Video. * Support Convert QT to Sony PSP Video. * Support Convert RM to Sony PSP Video. * Support Convert RMVB to Sony PSP Video. * Support Convert VCD SVCD to Sony PSP Video. 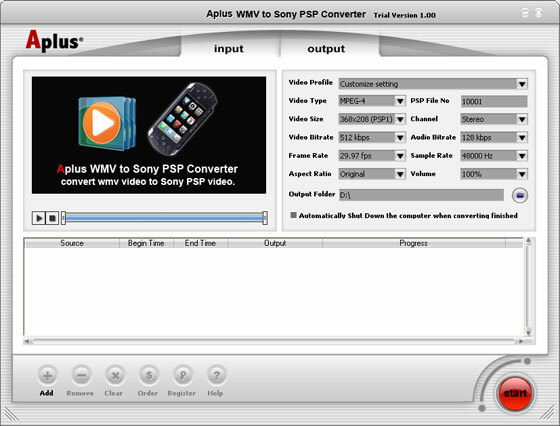 Qweas is providing links to Aplus WMV to PSP Converter 1.10 as a courtesy, and makes no representations regarding Aplus WMV to PSP Converter or any other applications or any information related thereto. Any questions, complaints or claims regarding this application Aplus WMV to PSP Converter 1.10 must be directed to the appropriate software vendor. You may click the publisher link of Aplus WMV to PSP Converter on the top of this page to get more details about the vendor.